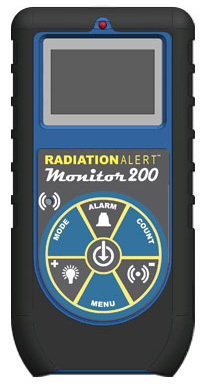 The Monitor 200, a pocket radiation detector, features an internal end-window G-M detector, measuring alpha, beta, gamma, and x-rays. The large digital display offers a choice of units in CPM, CPS, µSv/hr, mR/hr, or in accumulated counts. The Monitor 200 displays a red count light, and a beeper that sounds with each count detected. Other features include an adjustable timer, and selectable alert. With the Observer USB Software, the user can set computer alarms, calibrate the instrument, and download collected data from the internal memory. Detector Halogen-quenched GM tube with thin mica end window. Mica window density 1.5-2.0 mg/cm2. Effective window diameter is .360 inch. Side wall is .012 inch thick. Energy Sensitivity 1070 CPM/mR/hr referenced to Cs137, Detects alpha down to 2.5 MeV; typical detection efficiency at 3.6 MeV is greater than 80%., Detects beta at 50 keV with typical 35% detection efficiency., Detects beta at 150 keV with typical 75% detection efficiency., Detects gamma and x-rays down to 10 keV typical through the window, 40 keV minimum through the case. 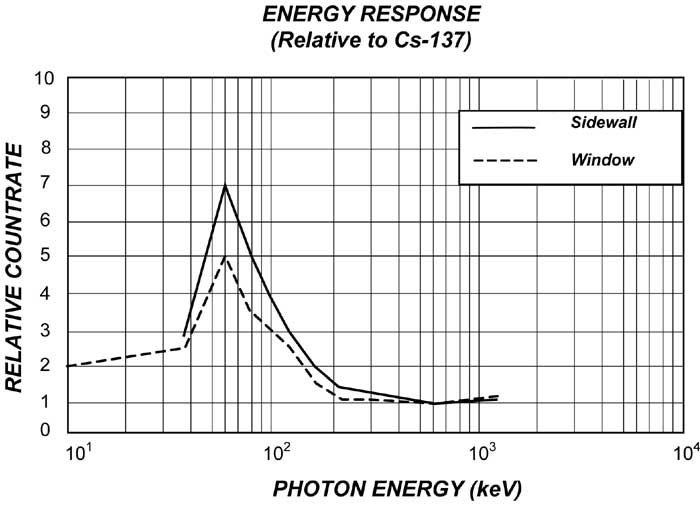 Anti-Saturation Readout will OVERRANGE in radiation fields as high as 100 times the maximum reading. Selectable Alert Set Range mR/hr .001 - 100 and CPM 1 - 350,000. Pulsating beeper sounds the alert. Adjustable alert levels are used for mR/hr / CPM, and µSv/hr / CPS. 70db @ 1m. Alarm will sound when in Timer Mode when set alarm threshold is reached. 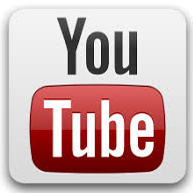 Display Graphic LCD with Backlight. Count Light Red LED flashes with each count.